Ethiopian Atsedu Tsegay demolished a highly competitive men's elite athlete field and also set a new Course Record to win the Airtel Delhi Half Marathon on Sunday. Tsegay stopped the clock at 59.12 minutes to lower by 3 seconds the course record of 59.15, set by countryman Deriba Merga in 2008. He was followed home by Kenyans Geoffrey Kipsang in 59.30 and Wilson Kiprop (59.49). Kipsang, the fastest athlete of 2013 (58.54) was coping with the loss of his 17-year-old brother Elais, who passed away on Friday and did wonderfully to overcome his grief and run a brave race, but was thwarted in his bid to win the race as a tribute to his brother by a strong running Tsegay. The women's race, also chasing a course record, failed in its bid due to a slow start, but picked up in the later stages and was won by Kenyan Florence Kiplagat in 68 minutes. Florence, the 2103 Berlin Marathon winner, led a Kenyan clean sweep, with Gladys Cherono finishing second in 68.03 and Lucy Kabuu taking third place in 68.10. The men's and women's winners were richer by USD 25,000. 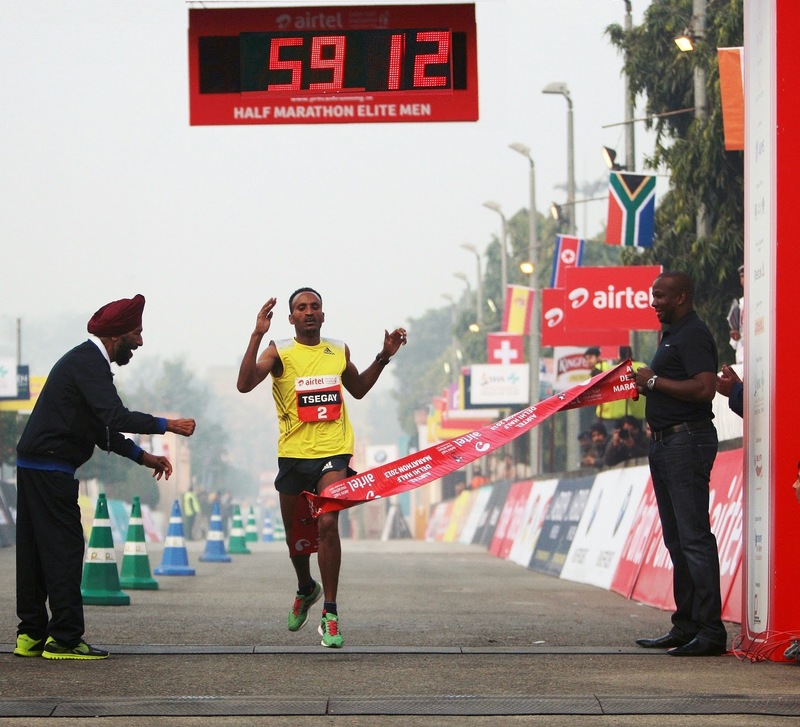 A total of 31,000 plus runners participated in the Airtel Delhi Half Marathon 2103, which offered total prize money of USD 210,000. The men's race began at a fast clip and was taken through the first 12 kms below the course record pace of 2.48 mins per km by pacers Vincent Rono and Timothy Kiptoo. After the pacemakers dropped out around the 12km mark, the pace fell a bit as the leaders assessed each other, before Atsedu took control of the race. The lead bunch of Atsedu, Kipsang, Kiprop and Kipkemoi were still running strongly and together, before Atsedu ran the 16th km in 2.45 to open up the lead. Both Kipsang and Kiprop pushed hard to keep up with Atsedu till the 18th km, who kept his foot on the pedal and gradually pulled away to win convincingly. 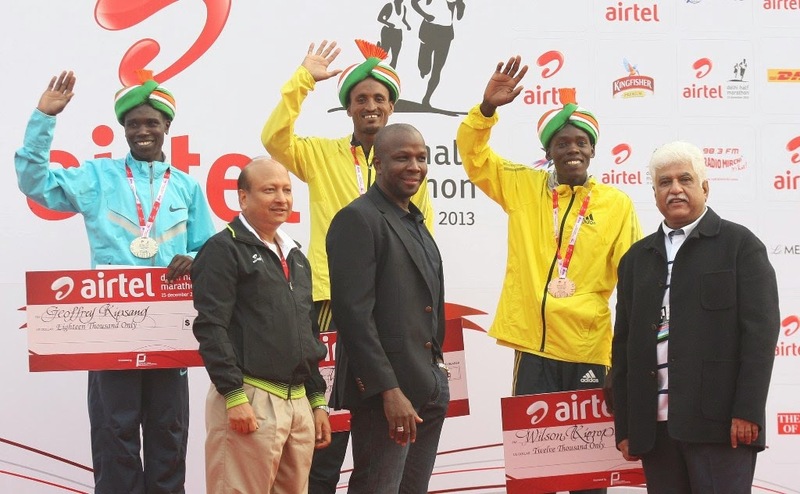 Defending champion Edwin Kipyego finished a disappointing eighth. Atsedu, the fastest athlete of 2012, had a poor run at this event last year, finishing 20th and suffering an ankle injury, that kept him out of competition for nearly a year. On Sunday he proved that he is back to his top form. 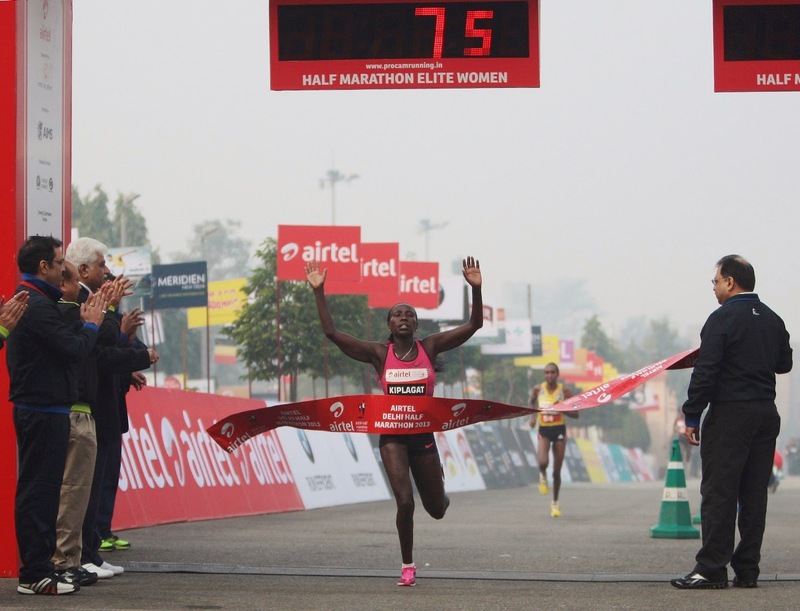 "I am happy to win the Airtel Delhi Half Marathon as I did not run for nearly a year because of an ankle injury. This is only my second race post the injury and am happy with my performance. I waited till 12 km and at 15 km I realized that I have a huge lead and will win the event. The climate was extremely cold so initially it was a little difficult to adjust to the conditions," said Tsegay. "This was a tough time for me, as I lost my younger brother two days ago. I was heartbroken, but I decided to stay and compete. I am happy with my performance and I would like to dedicate this race to my younger. While running, I only kept telling myself that I need to run and finish this race for my brother, "said Geoffrey Kipsang. The elite women had a slow start as they did not keep pace with pacer Alice Kimutai, but picked up the speed and went through the 5km mark at 17.10, much behind course record pace. The next 5 kms were faster and the 10km mark was passed through in 33.17, at which point pacer Kimutai dropped out. It was a bunch of 6 women that went into the lead, among them Lucy Kabuu, Florence Kiplagat, Meseret Hailu, Gladys Cherono and Wude Ayalew. Florence further pushed the pace to take the group through 15km in 49.12 before Meseret dropped back at the 16km mark. The next three kms were run at a fast pace at an average of 3 mins per km and by the 18km mark the three had opened up a lead of around 100m to Meseret Hailu in fourth. Atsedu Tsegay (ETH) 00:59:12 (NCR); Geoffrey Kipsang (KEN) 00:59:30;Wilson Kiprop (KEN) 00:59:49; Kenneth Kipkemoi (KEN) 00:59:55; Nicholas Kipkemboi (KEN) 01:00:24; Philemon Rono (KEN) 01:01:07; Gladwin Mzazi (RSA) 01.:01:12; Edwin Kipyego (KEN) 01:01:21; Leonard Korir (KEN) 01:01:25; Richard Mengich (KEN) 01:01:27. Florence Kiplagat (KEN) 01:08:00; Gladys Cherono (KEN) 01:08:03; Lucy Kabuu (KEN) 01:08:10; Meseret Hailu (ETH) 01:09:05; Wude Ayalew (ETH) 01:09:21; Emily Chebet (KEN) 01:09:22; Alice Kimutai (KEN) 01:10:09; Yebrgual Melese (ETH) 01:11:59; Lineth Chepkurui (KEN) 01:12:01; Paskalia Kipkoech (KEN) 01:12:02.